For over 200 years Dreadnought Tiles have been giving clay roofs character and timeless beauty. 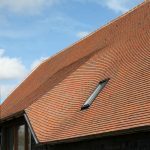 Our Machine-made, Rustic and Handmade rooftiles are all made in the UK, using traditional methods, in a wide range of clay colours. See also clay quarry tiles and brickslips on display from our sister company, Ketley Brick. Come and visit our stand and see how you can give character and warmth to your home with natural clay.